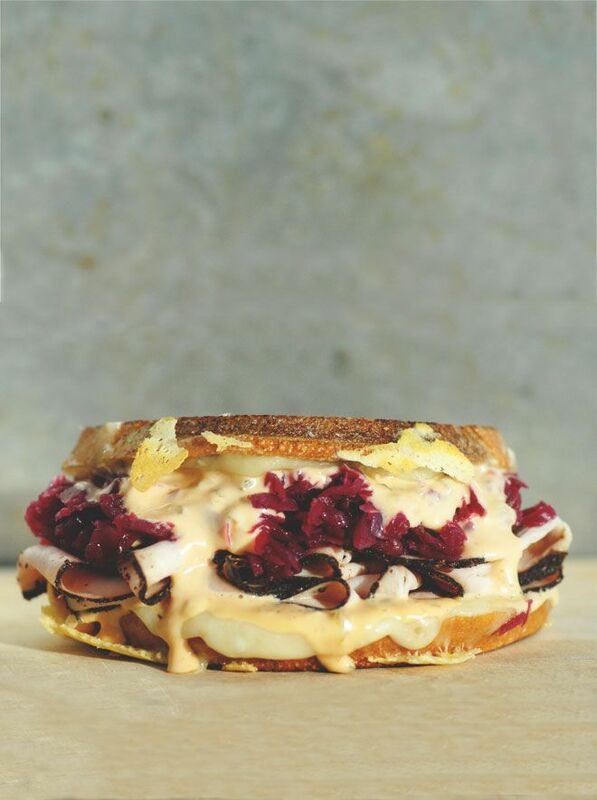 Although Reuben sandwiches aren't typically made with turkey, this healthy updated version is totally delicious. And once you make your own homemade Thousand Island dressing, you'll never buy a bottled version ever again. And a word to the wise, you don't have to be exact with that recipe—if you just eye it, it'll probably be even better! Note: while there are multiple steps to this recipe, this sandwich is broken down into workable categories to help you better plan for preparation and cooking. In a bowl, combine the mayo, curry ketchup, egg, peppers, mustard, Sriracha, pickle relish, and garlic. Stir until everything is incorporated, season with salt and pepper to your liking, and set aside. Take one slice of marbled rye and smear on some of your homemade Thousand Island dressing. Add a slice of cheese, the turkey, sauerkraut, and a second slice of cheese. On the remaining slice of marbled rye, give it a hearty smear of the Thousand Island. Close the sandwich. Butter both sides with the butter and set aside. Put the sandwich on a medium-sized skillet and turn the heat to medium. Let the sandwich cook for a few minutes on each side until the cheese starts to melt and the bread begins to crisp up. Once both sides are evenly browned, take it off the skillet and set aside for a minute so the cheese doesn't ooze out when you slice it. Slice the sandwich in half. Serve hot with an extra side of Thousand Island dressing. You will end up with more Thousand Island dressing than you need for this recipe. Keep it in an airtight container for up to 4 or 5 days or until it starts to ferment.